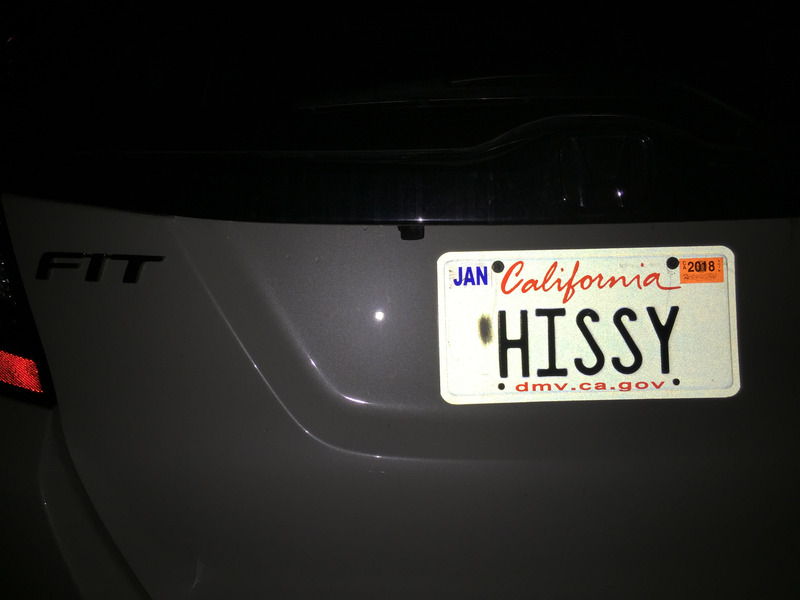 …that no one had these vanity plates yet! If that’s not the most natural pun in the world, I don’t know what is. As a general principle I try to avoid too much unnecessary personal information on here (yeah, right, so how’s that “principle” holding up he asks, looking at the hundreds and hundreds of pictures of our house and our trips and…) but this might be one of those things where total strangers will occasionally whip out their cell phones and take pictures and post them when they’re stopped behind me a stop light – so what the hell? Anyway, when I first got the Fit (which I still like a lot, she’s small and zippy!) I started calling her Hissy. Now the world can get to know her by name. This gives me way more glee than it probably should. Perhaps I’ve just been glee-deprived lately. Whatever.